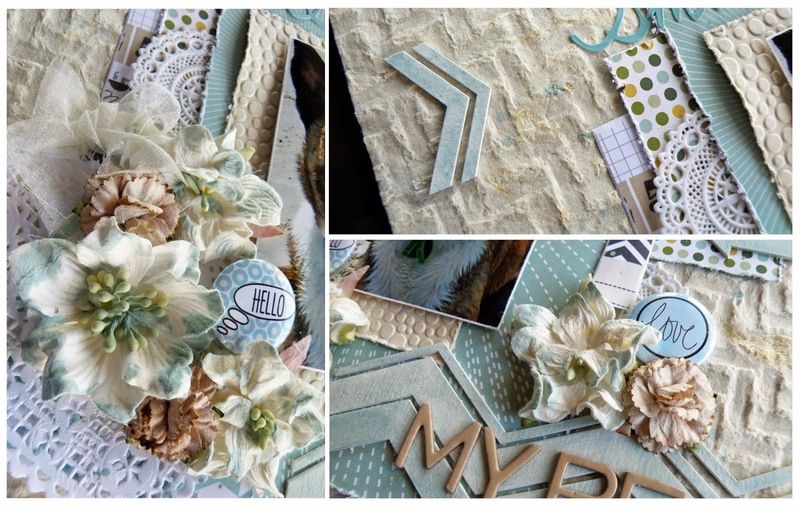 This is the final challenge I did for the Scrapbook Savvy Cyber Crop. I'm so excited I managed to do all the challenges, albeit not all on the weekend itself. But I still did them all!! Yay! Anyways this next layout was for a sketch challenge (see below). 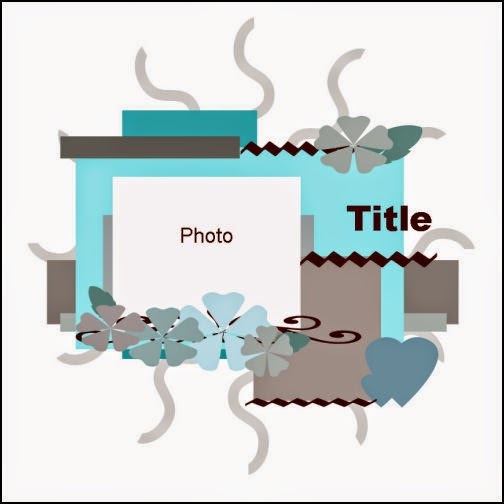 I had decided to challenge myself to create this layout without D-lish Scraps products but, LOL, I just couldn't do it. So, here's a list of what I've used .. PVC Doilies, a white Gardenia, white Azaleas, Flair Buttons from the Watercolour 2014 Script Words and Speech Bubbles packs, and brown Carnations. I used gelatos on my gesso-d chipboard and whilst I was at it, roughly added some to the edges of the white flowers to soften and blend them in a little. I played with the sketch a bit to accommodate my portrait orientation photo and to interpret the 'squiggly' lines coming out from behind the centre of the layout. I used chipboard arrows to represent those 'squiggly' line things. This was my first Cyber Crop in I don't know how many years and it was so much fun. Even more so because my girlfriend Sandy was here to play along with me. What now? Well I'm not losing my momentum that's for sure. I have a veritable mountain of DT work to plough through and I just can't wait to get stuck into it. I have three gorgeous new collections and some yummy mixed media products to work with! On that note I should probably get out of here. 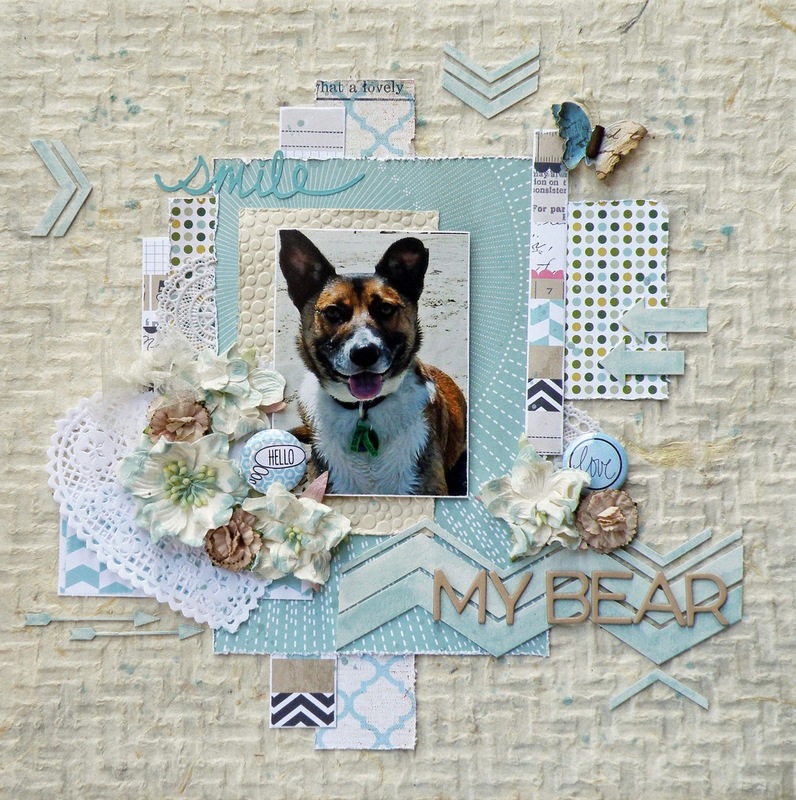 PS: If you don't hear anything from me for a wee while its because I'll have my head down, bum up, scrapping merrily away ..
Oh this layout is really lovely, the photo is adorable.. and love the blue colors you have used.. have a wonderful weekend! Awe what a cute puppy ;) and you've chosen such beautiful colours to show this photo off.